Sharmila Samant is a visual artist who works across a variety of media and forms including installations, performance and photography. Globalisation, identity and consumer culture are issues central to her works, which often involve working with activist groups and communities, particularly those who are marginalised, addressing in turn ideas relating to exchange, accessibility and authorship. 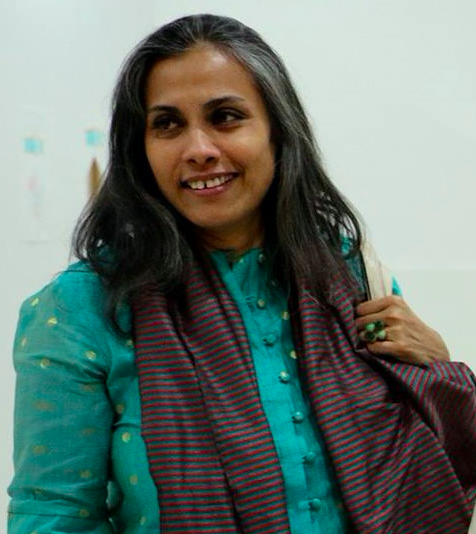 In 1998 Sharmila co-founded and ran for several years the Mumbai-based art collective Open Circle, which aimed to create a platform for meaningful dialogue among artists on an intercultural level, who were interested in engaging with contemporary sociopolitical issues via an integration of theory and practice. In 2011 she was invited as an advisor to Art1st Foundation, an organisation that works towards strengthening visual literacy, creative skills, cultural awareness and art pedagogy for children and educators. Since 2013, Sharmila has sat on the academic council of the G5A Foundation for contemporary culture in Mumbai, which supports contemporary art and culture, good governance and sustainability. She also sits on the advisory body of the culture initiative Arthshila, Patna. Sharmila’s installations and video works have been part of many prominent exhibitions in biennales, museums, artist-led spaces and alternative venues in India and abroad. In 2013 she was invited to become a core faculty member at the Department of Art, Design and Performance of the Shiv Nadar University, where she continues to work and run the Master in Fine Arts programme.